Why Choose Aikido? Not an unreasonable question, with the sheer number of Marital Arts and Self Defence systems being available today, Aikido could be seen as one of many different systems that appear at first glance to have similar goals in mind. What it is about Aikido that makes it both different from the other systems, and what reasons are there for choosing to train Aikido over other Martial Art systems. Striking – Striking is not the focus of Aikido as it is in other systems, yes there is striking, but it is often taught as a diversionary tactic, or or the purpose of defending against the type of strike being practiced in training. Yoshinkan and other hard styles do incorporate levels of striking, but nothing like the level seen in Muay Thai or Krav Maga for example. Peace – Aikido is often known as “The Art of Peace” and has universal world peace as its goal. 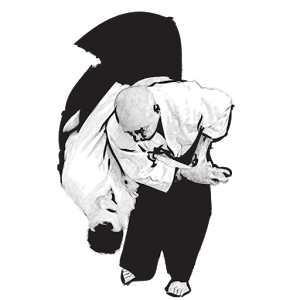 The founder of Aikido saw Aikido as real way to bring harmony back to the peoples of the world and these principals are still practiced today in many Aikido organisations. Protecting yourself and your opponent. Perhaps this seems bizarre to you that you would use self defence teachings to defend yourself, but not injure your attacker at the same time? Again this is another core teaching of Aikido that many Aikidoka aspire towards. There are various reasons to choose Aikido, but I would like to put this to you, consider what the situations are that you intend to defend yourself from, statistically, your chances of being attacked by a complete stranger are incredibly low. You are far more likely to be attacked by a family member, a friend or someone who is known to you. Consider the circumstances in which you may be attacked, suppose you have a family member who has Alzheimer’s disease and does not recognise who you are and lashes out at you in fear, do you really want to physically strike that person in order to defend yourself? What if there was another way that you could defend yourself and not hurt that person? There is, it is called ‘Aikido’. Suppose you were attacked by your partners teenage or pre-teenage son or daughter, angry that your presence in their home suggested that there would not be reconciliation between their parents whilst you are in the picture, again do you really wish to respond with striking and injury in that situation? Aikido offers you some other options of what you can do to respond peacefully in a situation just like this. Suppose you work as a Nurse or in Security and someone in pain lashes out at you, again Aikido gives you options to respond in a way that removes striking and injury to that person as an option in dealing with a situation just like that. Still Aikido can be quite hard and do significant damage if you are placed in a situation where you have to use self defence in a situation where people are trying to hurt you. Just like Judo, Aikido has techniques that can allow you to use your attackers own power and throw them head first into the concrete. Again we emphasise the peaceful resolution first and foremost, yet the fact remains that Aikido can and will defend you in a random attack should that ever come up. One of the things that I love about Aikido is the options that it gives you for Self Defence, yet it is also more than just a Self Defence System. Training Aikido can and will prolong your life and give you a better quality of life in the form of increased physical fitness. Self Confidence is often mentioned as a great product of Aikido training. What you will also notice is that Aikido is suitable for all ages to practice, you will find that is very much true on the mat, Aikido is inclusive of all and you will be made more than welcome no matter what your age or background. If you are considering taking up Martial Arts, then I can personally recommend Aikido to you It has done wonders for me in my own life and I have no doubt that if you can pluck up the courage to attend an Aikido training centre and give it a try, you will soon see what I mean! Not at all Philip, identify a training centre and speak with the Sensei directly and they will answer any questions you may have!